Fortnite's becoming the most popular game right now, with even Drake setting aside his time to play it. So what exactly is going on and just what is all the fuss about? 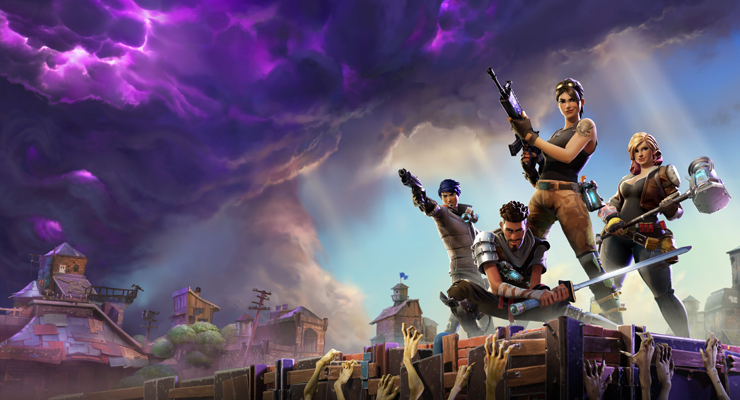 The games publisher, Epic Games reported that Fortnite had more than 45 million players in January and it even surpassed PUBG and Minecraft. Drake said that he's been playing the game for a couple of months now, and following some of Ninja's streams. Yesterday he joined Ninja on Twitch, and broke the record of most viewed single player game stream. The video had 630,000 viewers at one point, surpassing Dr. DisRespect's record of 388,000. Fortnite has become the most-talked about, and most searched game online. Google's search volume for the game, has surpassed even Minecraft and bitcoin. Fortnite is a survival game launched by Epic Games. The game's set on Earth, following a global storm, that's left only 2% of the population alive, and zombie-like creatures that threaten the survivors existence. Fortnite can be played by up to 4 players that work together on different missions, collecting resources, constructing weapons and traps, building fortifications, and fighting against the creatures that aim to destroy everything they build. The game is available for PlayStation 4, Microsoft Windows, Mac and Xbox One. Fortnite Battle Royale was released in September 2017, available on the same platforms. Fortnite Battle Royale is a FREE version of the game, with a 100-player PvP mode, and a giant map on which to engage in intense battle till only one player remains. Not only is Fortnite the most searched term on Google right now, but it's also become a pop culture phenomenon, that Twitch streamers, gamers and even rap stars are joining in to participate. The top spot on the world's most played games list has been consistently reserved for Fortnite. Fortnite's popularity grew with the release of Fortnite's Battle Royale which was an instantaneous hit, and is still picking up millions of new players, with a total count of 45M so far. The surge in popularity is also due to the remodeled and updated map, which brought a lot of new players to the game. The famous rapper had his Twitch debut yesterday, when he played Fortnite Battle Royale with a rising Twitch streamer, Tyler "Ninja" Blevins and not only did they broke the record for most viewed single player stream, but this also helped Ninja gain a lot of new subscribers, more than 90,000 to be exact. While Fortnite is the most popular and most streamed game these days, with hundreds of thousands of people who watch live streams every day, Ninja's stream from last night was a bit different, as it featured Drake, rapper Travis Scott, and NFL player/game streamer JuJu Smith-Schuster. Drake and Ninja played a few matches first, and then the four of them played as a team. This was a huge moment for Ninja, who had gotten over half a million view, as well as 90,000 new subscribers. Twitter was lit and memes were flying all over the Internet as Ninja and Drake were joking around and talking about all kinds of stuff last night. At one point Drake was even defending pineapple pizza. Whaaat? He also mentioned that he's a vegetarian, but most of the time they just talked about Fortnite. Drake said that he had been playing Fortnite for some time now, and watched a few of Ninja's streams as well. The both of them joked around and talked about the future of Fortnite. Drake shared some of his opinions about the game, and what he thinks they should concentrate more on. You could see solid teamwork in the game (Drake dropped weapons for Ninja, and revived Travis Scott), and you can check out all of their jokes and banter by watching a recap of the stream right here.